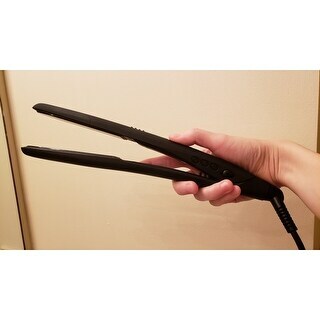 The iron heats up fast and it is able to tame my thick and frizzy hair. I would definitely recommend this styling iron to family and friends. Style your hair to perfection in as little as 10 minutes with this styling iron. Natural rock minerals infused into the tool help keep your hair hydrated and conditioned. As the outer cuticle layer lies flat and smooth, trapped moisture provides a perfect gleam. Hair is silky, soft and smooth, elasticity and shine is unbeatable. As a stylist of 20+ years I have been through the journey of best, the worse, and the “why was this even created!” This is definitely one of the best! Now for those of you wondering, and I know you are because I have, it is great for all types of hair, but especially for more course textures such as 4a, 4b, and 4c hair textures. Personally, I have a very thick, course, 4c hair texture, with low porosity, and I’m growing it out naturally. (Yay!) I don’t usually use heat on my hair, so it’s “untrained” and very resistant on a gentle heat temperature. (The battles are epic!) This iron on 380 glides through, with the vibration, and my hair is instantly silky straight, soft and the moisture is locked in. And where my hair quickly reverts, with this flat iron, it lasts for days! As I tell my clients hair tools and products are an investment. This is a flat iron to invest in. The payoff is instant gratification!! My one and only dislike is the auto shut off. I would LOVE to disable that feature! 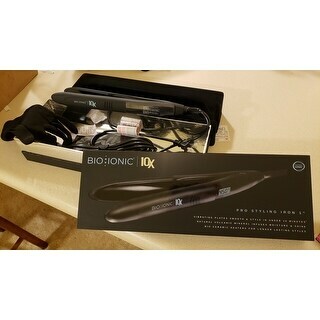 I bought the Bio Ionic 10x Pro 1 -inch Styling Iron as a gift for my daughter for Christmas. She Loved this styling iron, it works wonders!! what she love the most is how shiny &amp; healthy our looks as soon as it touches it. I must say I finally found the perfect one. 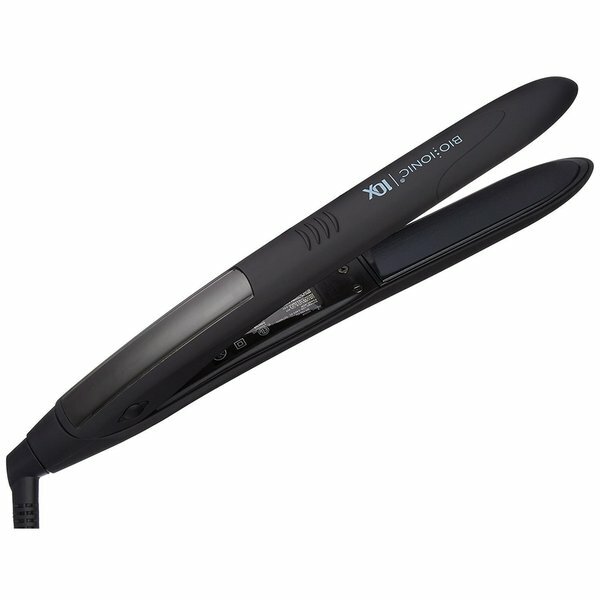 I expected much more from the Bio Ionic 10x Pro 1-inch Styling Iron based on the reviews. I found that the vibrating feature tugged at my hair. I love my new Bio Ionic 10x Pro Styling Iron. It was recommended to me by my hairdresser. She told me how in love she was with it. After searching on-line, I found that Overstock.com had the best price. It arrived in about 8 days in perfect condition. I love the way my hair is so completely straight after using it. I would definitely recommend it to anyone who has colored, wavy hair for a completely straight hair look. Holy moly! What a difference the right tool makes. I wish I had this sooner!!! I have problem hair. First of all, there’s a ton of it, but none of it seems to match. It’s all very fine, but straight toward the front, wavy in the back, and the gray hair coming in is course and curly. No matter what I do to it, it protests. Straightening has left it dull and fuzzy in front and lumpy in the back after 5 minutes in the south Texas weather. Curling was equally frustrating. When my GHD flat iron began shorting out, I started scouting for a replacement. I had bought the GHD after reading reviews and recommendations, but was never really thrilled. I figured my hair was hopeless. I found the Bio Ionic 10x Pro and took a gamble after reading/watching reviews. It took a week of bad hair days to get here, but it was worth the wait! I set it to 380 and engaged the vibration and my hair was smooth and shiny in one pass. Smooth and shiny, y’all! I’ve never been so excited about a a hair product or tool in my entire life! Even my little grandma hairs fell right into place like they knew what to do all along! There is zero snagging. It curls perfectly as well. I am thrilled and for once in my long life I’m not dreading fixing my hair. Win! This flat iron is AMAZING! Hands down the Best flat iron I have ever purchased. I have natural 3B/3C curls, & this flat iron straightens them perfectly. The vibration feature helps the straightening process, & I love it! This flat iron leaves a shine on my hair. I previously used a Chi for a little over 10 years, but not any more. This flat iron is WAY BETTER! If you have ethnic hair, you need this flat iron! So far I am very happy with my new Bio Ionic 10X Pro 1-inch Styling Iron. It gets my wavy/frizzy hair soft and sleek in no time. As promised, it increases shine as well! This is honestly the BEST STYLING IRON that I've ever purchased. It is well worth the money, and I initially thought the vibrating plates were going to be just a gimmick. However, they do straighten better, faster and with more long lasting results than other expensive flat irons that I've bought in the past. 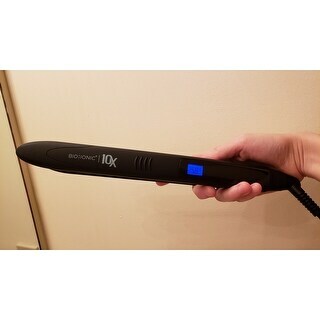 I sincerely recommend the Bio Ionic 10 X Pro Styling Iron ~ and it is packaged in a very attractive black and silver box ~ too pretty to throw away . After a long research I decided to get this iron and so far after using it for two weeks I love it! It requires way less heat than the regular/cheaper ones to get great results, and by great I really mean beautiful results!. The price here in overstock is excellent compared to Sephora. The iron is brand new, the whole package arrived in perfect condition which makes it perfect for a gift. Other extras are the volcanic plating to protect your hair, vibrating plates to get even results, dual voltage so it's international proof, long rotating cable and includes a glove. In general, highly recommended! I like this product!!!! This styling iron is perfect!!! Its work excellent. Best flat iron on the market. I have very coarse hair I need high temp to straighten my hair. I have always used the Chi flat iron but now have a new iron that works even better. BEST FLAT IRON ON THE MARKET! Ok, you have to know I own many flat irons at medium and high price points! I flat iron my hair twice a day minimum as I live in humidity!! I have Med thick wavy hair and I wear a medium length bob for many years. I have looked for THE iron that won’t dry my hair out.... and this one has been the best! Yes, it takes less time to straighten as many have said! OF COURSE you need to always use heat protectant product. 2 Thumbs up!!!! As a licensed hairdresser and instructor with 3 decades of experience behind the chair - this is the best flat iron I've ever used! The vibrating plates make the hair straighten quicker so fewer pass throughs to get the job done. It heats up quickly plus the high heat temps stay consistent throughout styling allowing for use during the current and popular straightening services too. The rounded tip allows you to get down tight at the base, near the scalp, especially helpful near the front hairline. This is a fantastic tool and well worth this price! When I told my stylist I needed a new straightening iron, this is the one she recommended. I was happy with the price on this iron (vs other sites) and eager to try it. It works beautifully! With little ones, I don't have a ton of time to spend on my hair. This iron gets the job done effectively and quickly. Side note- definitely use a heat protectant before using to protect strands! My review is not about the product its about OVERSTOCK AND FED EX. FIRST TIME USING OVERSTOCK AND THE VERY LAST, THE BIGGEST MISTAKE I COULD HAVE MADE!!!!!!!! Arrived dead on arrival and not working. I requested a return and sent it back with no problems and had my money back in no time. I wouldn’t waste my time on this straightener. This was the best price on the internet but I'm sure they're are better straighteners our there. Love this product! I was looking for a flat iron that could double as a curling iron and I found just that. Love the way this straightens and curls my hair. Another bonus is the adjustable heat setting. Would highly recommend this product. This straightening iron is the best, and I've used a lot. It's so quick and heats up very fast, too. It is absolutely worth the cost—definitely give it a try! would not recommend at this price. Love this hair straightener! I highly recommend it. I’ve owned drugstore flat irons and, in the last several years, Sedu and Solia flat irons and this is by far my favorite. I’ve owned it for around 6 months and used it at least a couple times a month in that time. It’s faster to straighten my hair and my hair stays straight for longer (it tends to want to curl). As always, use a heat protectant spray! While it’s just ok without the vibration turned on, with it on it’s magic! It does have a higher price tag but I did some research before purchasing and Overstock had the best price by far. I love this item! It works great for my hair. My hair professional recommended this flat iron and I loved the way my hair looked when I left her salon. Was not disappointed at all when this one arrived. I have very thick coarse hair and one pass straightens it. Love! I have bought so many straight irons in my Life and have never found one that didn’t either break, burn my hair off , and all those other fun things. This iron is amazing, you can set it to vibrate when both ends touch so you know you’re really getting the hair. It gets hot fast and straighten your hair nice, no fly always. My daughter curls her hair and does all kinds of things with it. love it. leaves my hair silky smooth. "i saw the response below that the 10X does not come with the 5 yr. warranty, which is included when purchased at the higher price from other stores. Has anyone had a problem with the 10X breaking or otherwise not being usable? If so, after how much time?" "What is the difference between the bio ionic pro 10 MODEL 10XM Item"
Bio Ionic does not make a 10XM model. "This item is suppose to come with 5 year manufacturer warranty but the item description doesn’t say anything. Will the manufacturer honor the warranty if bought from overstock?" No, unfortunately this does not come with a warranty. "Are these refurbished or brand new? Wondering why are are so much cheaper than anywhere else? " "I am not the type of person to section off my hair because it just takes too much time. I tend to just pick up chunks of hair to straighten and some flat irons tend to snag my hair while others don't. Did this flat iron snag your hair at all?" This has never snagged my hair! You will not not reget this purchase! "Can you adjust the heat setting on this?" Yes, it is adjustable from, I believe, 280 degrees to 450 degrees. It is a digital reading and heats up very quickly. Yes, and it heats up super quick. "I currently own the Bio Ionic, one pass, which i LOVE... straightens great, gives me great beach waves... every time I try something new i fall short and end up disappointed. I tried GHD which people rave about which i just dont see it and hairart which does a good job getting my hair straight.. however I prefer to have an all in one tool, which can straighten or give me bouncy waves. This one is a hefty price to pay, so if anyone has tried the Bio Ionic, One Pass and this one please tell me which one would be the best to go with?"